Orbitz.com listed Orlando as the #1 destination in 2012 for Spring Break. Whereas a lot of visitors will be visiting Orlando this year to visit Islands of Adventure at Universal Studios to drink butter beer and to experience the original Harry Potter ride and the New Fantasyland at the Magic Kingdom, a lot of Orlando locals will be heading to the beach. Below is the first of a four-part series for celebrating Spring Break in Orlando that will consist of listing Orlando’s three destination beaches of Cocoa Beach, New Smyrna Beach, and Daytona Beach and finally what the theme parks will be up to as well for spring break. Cocoa Beach is Orlando’s closest beach and can be accessed by heading down the Beachline Highway (Toll Road 528) and is about a 45 minute drive from Orlando International Airport. 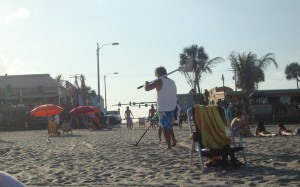 Cocoa Beach has a few entry points that each offer a little different experience. The Cocoa Beach Pier is the main gathering spot for all family beach-goers and has a lot of things for families to do between the restaurants and gift shops that are on property, including plenty of spots of just laying around on the beach and getting some sun. The aptly-named Atlantic Ocean Grill is a casual seafood restaurant located at the end of the pier that has great views of the Atlantic Ocean and fresh seafood to eat. A few blocks south of the pier are the parking garages of the infamous Ron Jon’s Surf Shop and Cocoa Beach Surf Company that offer free parking with access to the beach. This is a great spot if you are interested in learning to surf or watching the surfers catch some waves. You can also take some time to check out the surf shops in which the former is the original shop that helped to really kick off the Ron Jon’s line of surf shops since 1963. Downtown Cocoa Beach is the location of Orlando’s and Cocoa Beaches best beach bar in Coconuts on the Beach and the low-key Beach Shack next door on Minutemen Causeway. Coconuts caters to the party college crowd that can be a little bit too much for families. Coconuts has live music and fresh seafood and is located directly on the beach with showers. A couple of the best seafood restaurants in the area are located in the Cove shopping district of Port Canaveral where you can relax and enjoy a sandwich and watch the large cruise ships go by over the weekends. Two of our favorites is Rusty’s Seafood & Oyster Bar and Grills Seafood Deck & Tiki Bar. This entry was posted in Recreation and tagged april, beaches, cocoa beach, labor day, march, memorial day, seafood, spring break. Bookmark the permalink.